I was wondering if there was much of a difference between Federal HST and Hornady Critical Duty . And which would be best for winter use? Better expansion with HST, but what caliber? I don't think Cirtical Defense has really been tested out (I haven't seen any data). I made a spread sheet of all the rounds I could find (scroll down a little from the link above and zoom your browser). HST 147g is best in bare gelatin. If concerned about clothing (you mention winter round) the Ranger T 147g is the best in 4 layer denim in terms of penetration/expansion (but the HST 147 is in top 3 or 4 so I think it is the best overall round, but I live in Florida so I'm less concerned about heavy clothing....). Again, my data does not include Critical Defense, and I don't see it listed on the "approved" list but I think it may be relatively new and off list from lack of testing, not necessarilyl lack of performance. Find the penetration and expansion data for Critical Duty before deciding. I was AMAZED at the differences in populat hollow points in that some are SOOOOO much better/worse than others. ILLEGAL IMMIGRATION: The "debate" ends at the first word! I'm sold on HST myself. expansion is quite weak on the critical duty compared to the gold dot , hst, and ranger series. Doc was going to be testing some, don't think he has posted results yet. The cavities in HST and Gold Dots (the two I personally use) are REALLY deep. I think they'd be just fine expanding even after traveling through heavy clothing. Look up some 4LD tests, however. Just ran numbers on the 9mm +P 135g Critical Duty, and it looks pretty marginal. Volume is 3.71/3.15 in bare gelatin/4 layer denim. 147g HST is 6.81/4.67. 147g Ranger T is 4.61/5.29 (best in heavy clothing). HST in .40 and .45 is top performer in BOTH bare gelatin and 4 layer denim. 9mm HST is best in bare, Ranger T best in 4 layer denim. Use heaviest bullets in all cases and the .45 +P HST is better than the 230g normal pressure. Been looking around - where can I find comparisons between the .45 HST 230 & the HST 230 +P ? Check out these guys on youtube he has done about all the gel test on 45 ACP. The TNoutdoor9 guy is the main guy to look at his videos. Great! Just what I was looking for - looks like the +P just edges out the reg 230 in almost every category - but just barely. Considering that I'm moving up from 9mm & 40 - I think I'll stick with the non +P and focus on clean first shots and rapid follow up/double taps. Not impressed with any critical duty offerings. I'll take HST over anything. HST, Gold Dot, Ranger are the three best 9mm rounds in my opinion. I personally like Gold Dots best. I currently have gold dots 124 grain +P loaded in all my glocks, but as soon as I cycle through the rest of that I will be using my 147 HSTs. Don't Blame Me- I Voted For Romney! Where do you buy this stuff...when the world isn't in panic mode? I'm assuming that finding some now would be pretty tough. Thank you sir, they sure did. I decided to go with the 124+p HST's. Unless you are shooting out of a short barreled pistol, you may want to rethink the +p HST 9mm , it expands to quick to penetrate the recommended 11 inches or more. 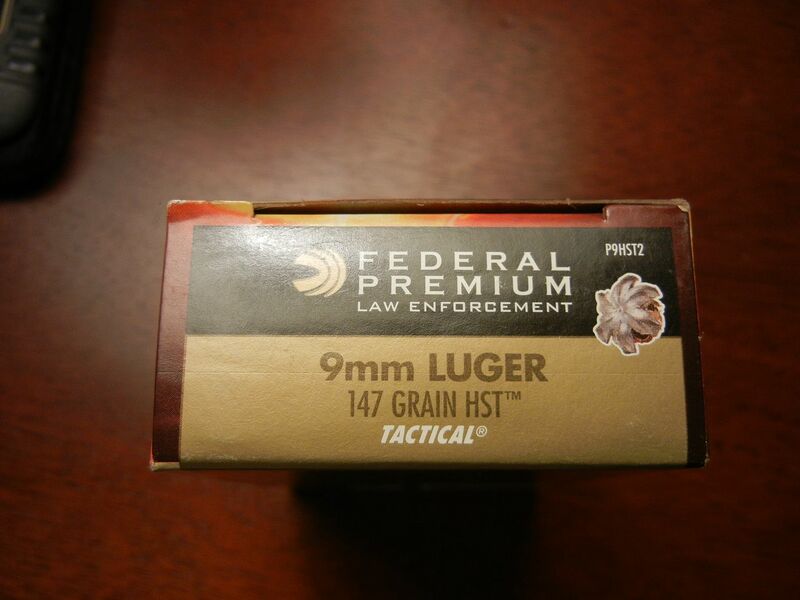 The 147 grain gives best results according to all test including the FBI test. I think they drop the ball on there duty load as well. Are they worried about over penetration? 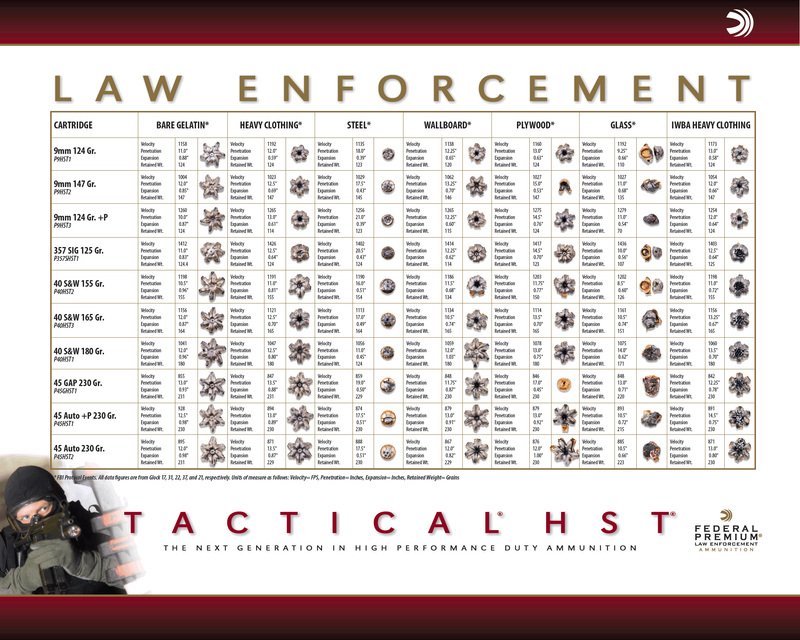 Both will serve well and penetrate well, but the 147 hst has been around longer in is proven ammo. I wish someone would try these tests using a thick winter Carhart jacket. I have an old one with large holes worn in it, and it has the black winter inside lining. This jacket has kept every hollow point I have tried from expanding, except for the Critical Duty loads. I realize they have to set standards, but people around here wear far more then four layers of denim during the winter. I bought some of the non +p critical duty the other day because that is all that was available.